Applications are now welcome for the Centre Director role for The Great Tapestry of Scotland, the nationally-significant attraction set to be housed in a purpose-built setting for the first time in Galashiels. Charity Live Borders is offering a career-defining role to a talented manager with the skills and experience to operate this major addition to the tourism sector in the Scottish Borders. Created by renowned writer Alexander McCall Smith, historian Alistair Moffat and artist Andrew Crummy, the Great Tapestry of Scotland tells the country’s story through 160 panels, making one of the largest tapestries in the world. The new building which will house the Tapestry has been designed by one of Scotland’s leading architectural practices, Page / Park, while the adjacent former Post Office will be re-purposed to bring the B listed building back into use. There will also be retail, café, educational and temporary exhibition space, as well as an ongoing events and exhibitions programme. 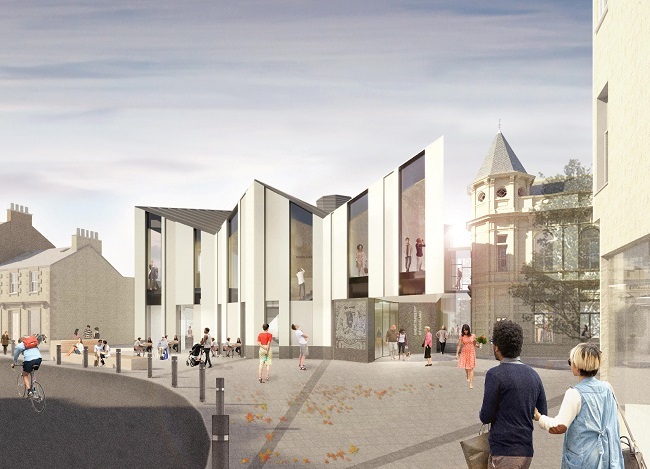 The visitor attraction is seen as a catalyst for the regeneration of Galashiels, which has a proud textile heritage, and the wider Scottish Borders, providing significant economic, social and educational benefits when it opens in 2020. Experts predict that the centre - within walking distance of the Borders Railway - will attract over 50,000 people to Galashiels each year once opened, as well as create 16 jobs. Almost £900,000 of extra spending per year is predicted for the local economy, providing 12,000 extra visits to complementary attractions, supporting a further 17 jobs. The new attraction will be managed by Live Borders, a charity employing over 250+ people across the cultural, sports and leisure sectors, and welcoming well over a million people to its sites per year. They operate many of the cultural and heritage highlights in the Scottish Borders, such as Heart of Hawick, Harestanes Countryside Visitor Centre, Mary Queen of Scots Visitor Centre and Jedburgh Castle and Jail. Jane Hogg, Commercial Director for charity Live Borders, said: “The Great Tapestry of Scotland is a phenomenal achievement and this new visitor experience will celebrate the creative talents of the army of 1,000 stitchers, the story of Scotland, and its people; it is a triumph of creativity, skill, community and patience. “The Centre Director role for this new visitor attraction, which is planned to open in spring 2020, is a brilliant opportunity for someone with leisure, cultural or hospitality sector experience to open one of Scotland’s newest and most eagerly anticipated tourism destinations. This role will play a key part in delivering the target of bringing the 50,000+ visitors we want to attract to Galashiels, as well working in collaboration with the wider community; we want everyone to be proud of this landmark project. Scottish Borders Council’s Executive Member for Business and Economic Development, Councillor Mark Rowley said: “The Great Tapestry of Scotland will not only create a national destination visitor attraction and significant community facility in the Borders, it is also playing a key role in the regeneration of Galashiels. “With the Borders Railway on its doorstep, we also have the prospect of the Tapestry attracting thousands of visitors from Edinburgh to discover the wider Borders. Scottish Borders Council is currently engaging with contractors on the building of the visitor centre, with construction scheduled to begin in spring 2019. For further information please contact recruitment@Liveborders.org.uk for an application pack quoting job reference 0377. The closing date for applications is 8 February 2019. Interviews are expected to be held on 25/26 February 2019.